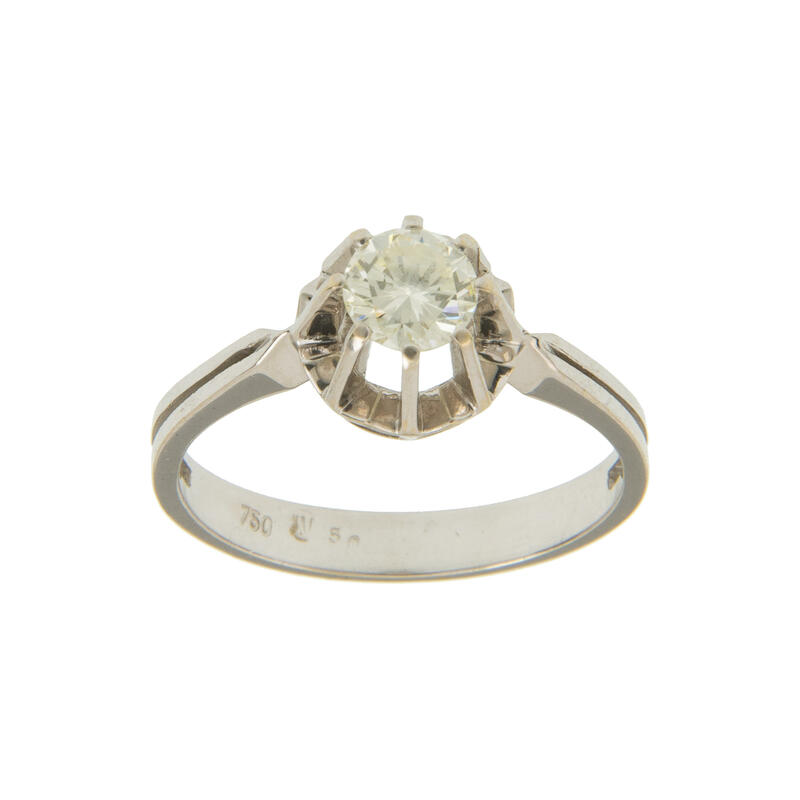 3258 Ring MEMOIRE brilliant ring - 14 K white gold, set with 24 brilliant-cut diamonds. Ring size 60. Alloy 585 / 000. A very nice ring. 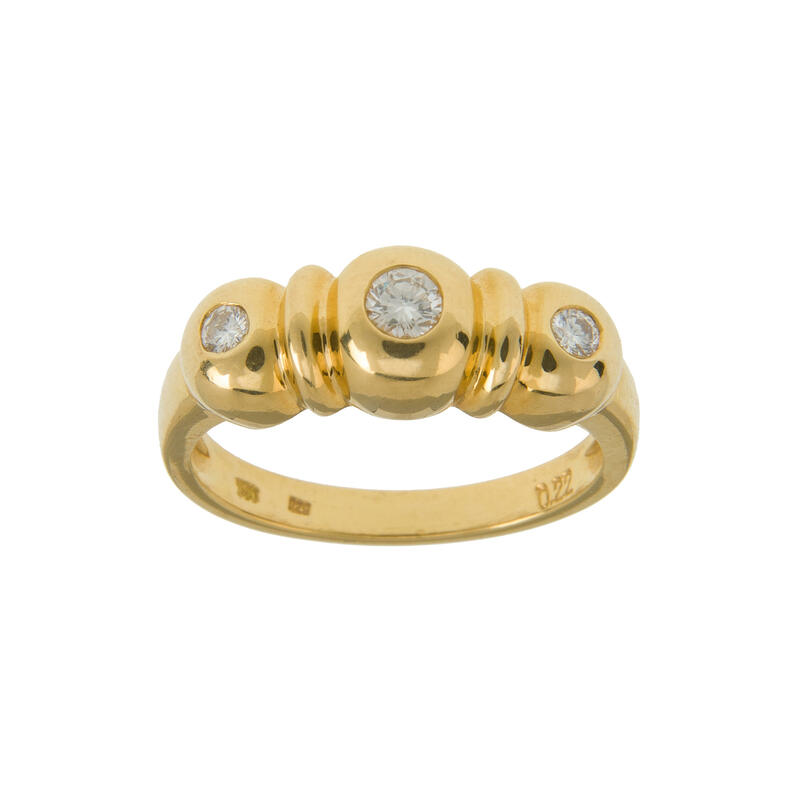 3259 Ring Brilliant ring - 18 K yellow gold, separately rotating ring rail set with seven brilliant-cut diamonds, ring size 52. Alloy 750 / 000. A lovely gold work. 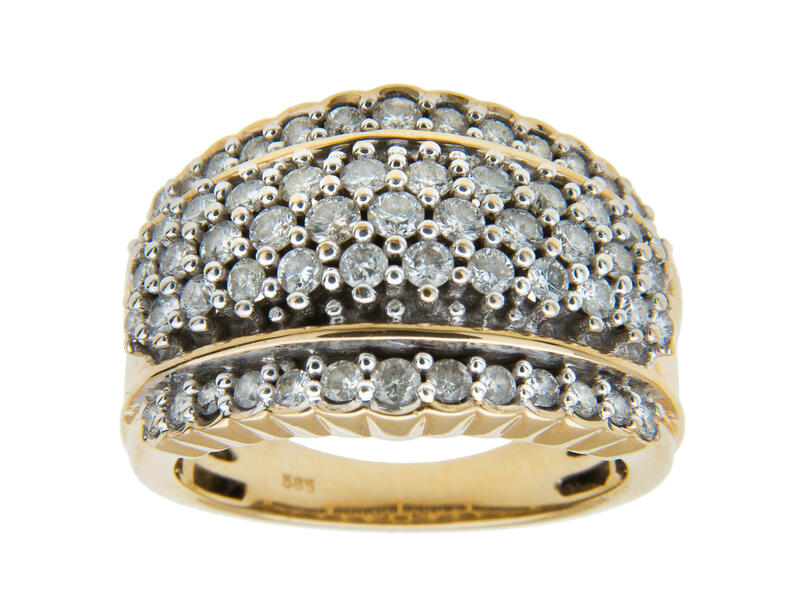 3260 Ring Brilliant ring - \"MARCO BICEGO\", 18 K yellow and white gold, set with five larger and various smaller brilliant-cut diamonds, ring size 54, alloy 750 / 000. 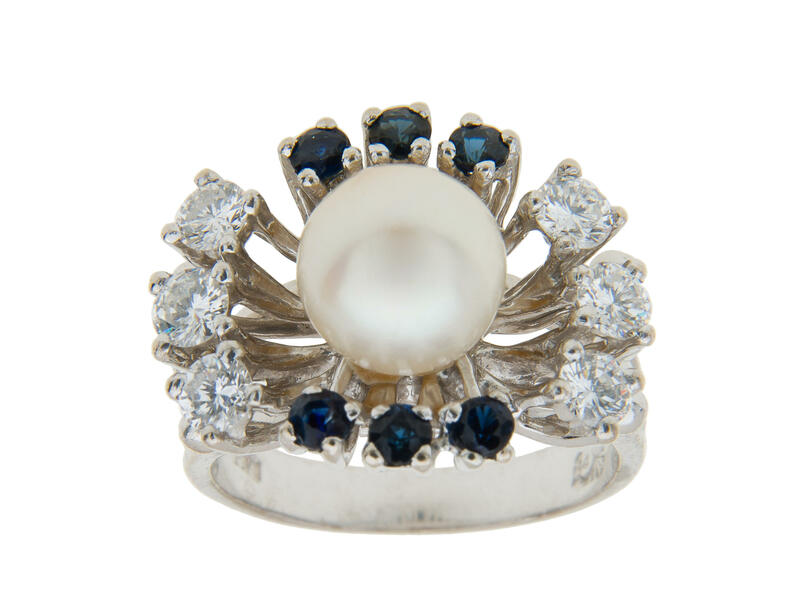 A dreamlike nice designer ring. 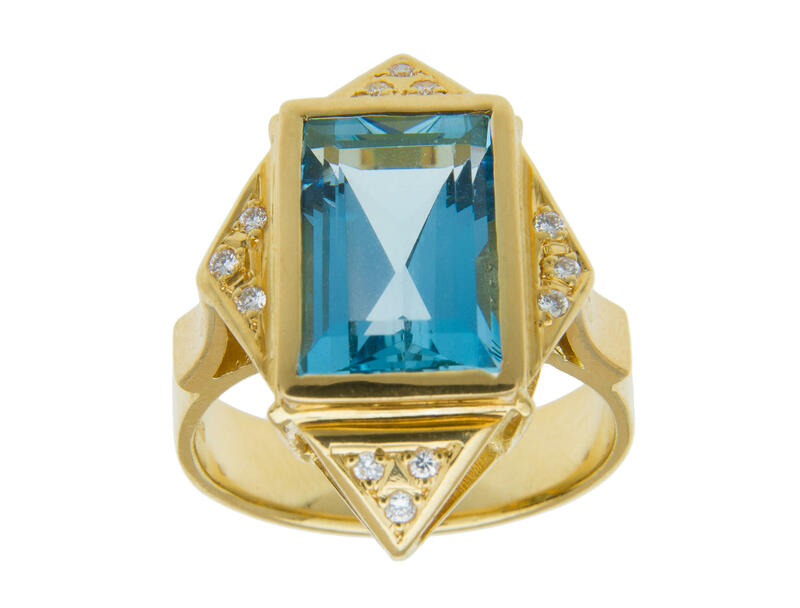 3261 Ring Noble Topaz ring - 18 K yellow gold, set with a large noble Topaz with approximate 7 ct. As well 12 brilliant-cut diamonds W / Sowed with together approximate 0, 18 ct. , ring size 60, alloy 750 / 000. A very nice, impressive ring. 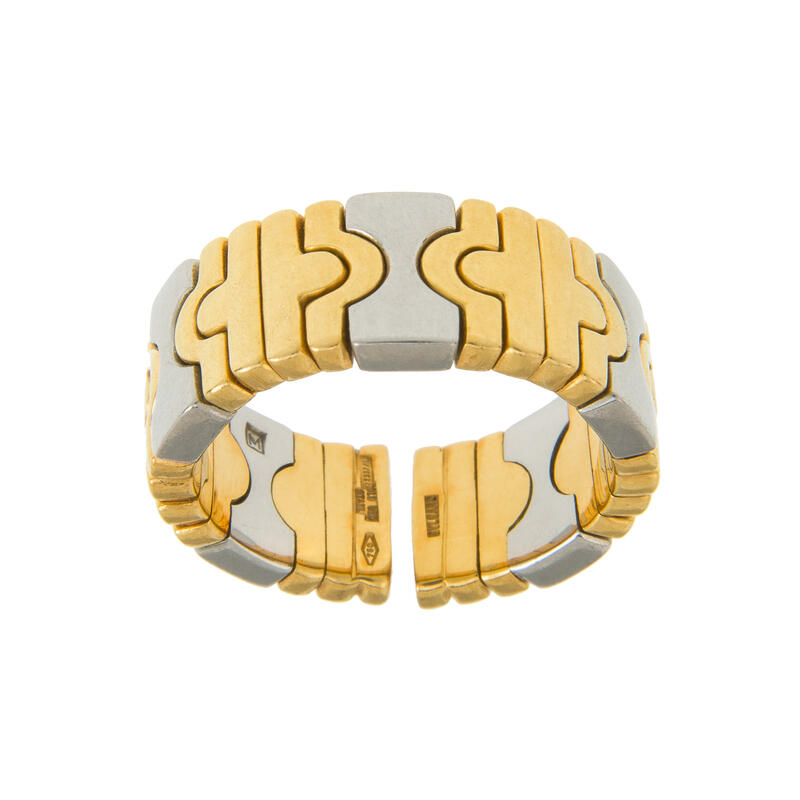 3262 Ring BULGARI-RING - 18 K yellow / white gold, reference no. 2337 AL, ring width minimal 17 mm (clasp ring). Alloy 750 / 000. A very beautiful ring of the world famous brand. 3263 Ring Brillant sapphire ring - 18 K white gold, set with in each case six brilliant-cut diamonds W / VSI with together approximate 0, 6 ct. And six sapphires as well centered an Akoja pearl, ring size 55. Alloy 750 / 000. A dreamlike nice ring. 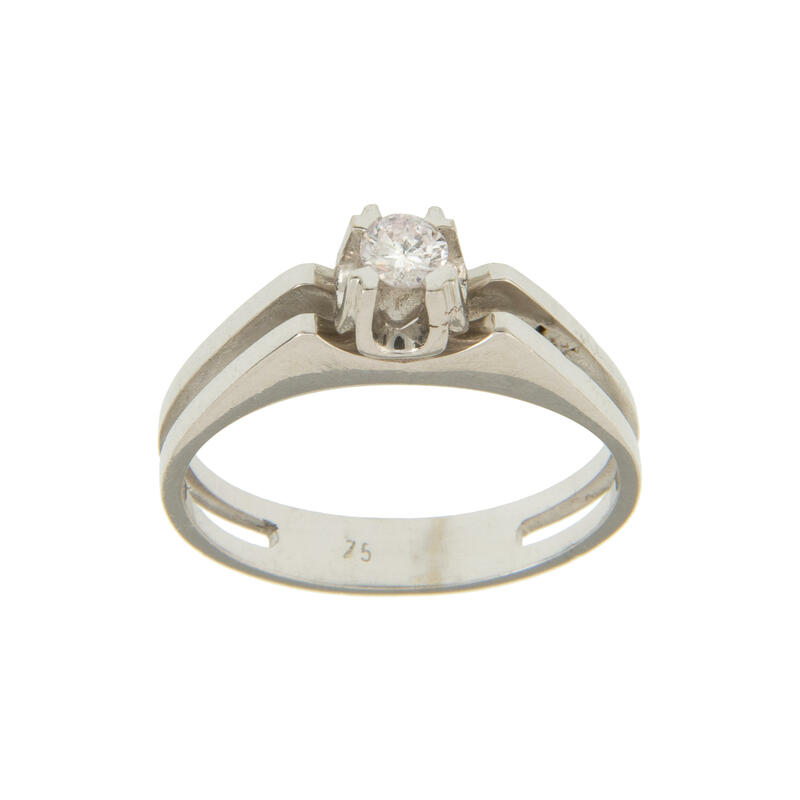 3264 Ring Brilliant ring - 18 K white gold, set with a brillant solitarily C / VSI with approximate 0, 4 ct, ring size 57. Alloy 750 / 000. A nice ring. 3265 Ring Brilliant ring - 14 K yellow / white gold, set with fifteen brilliant-cut diamonds W / Sowed with together approximate 0, 81 ct. Ring size 53. Alloy 585 / 000. A very nice ArtÂ Deco ring. 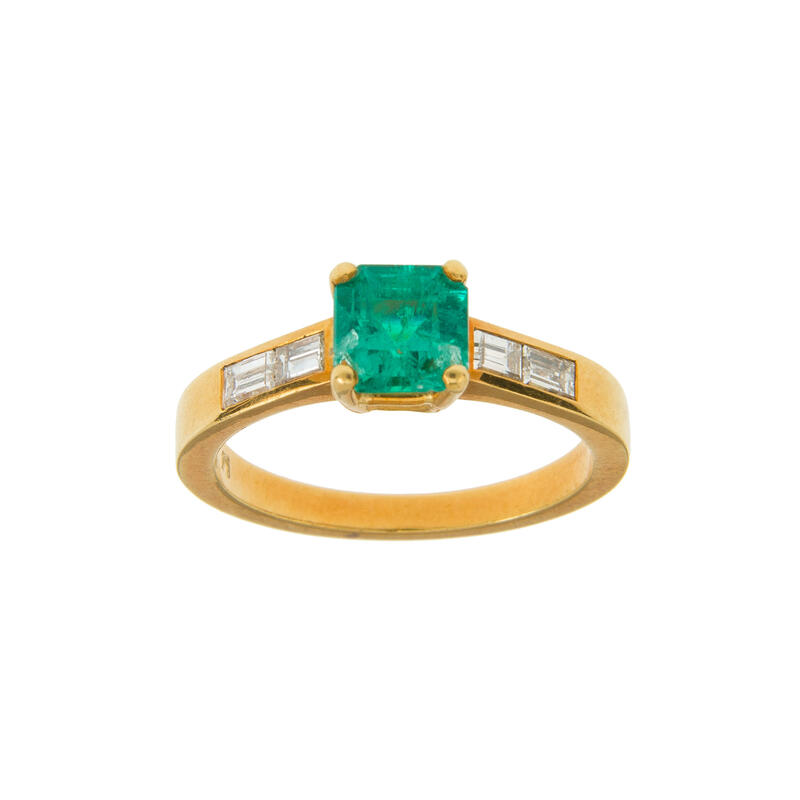 3266 Ring Emerald brillant ring - 18 K yellow gold, set with a Colombian emerald with 0, 84 ct. (defective) as well four diamond Baguettes TW / IF with together approximate 0, 33 ct. 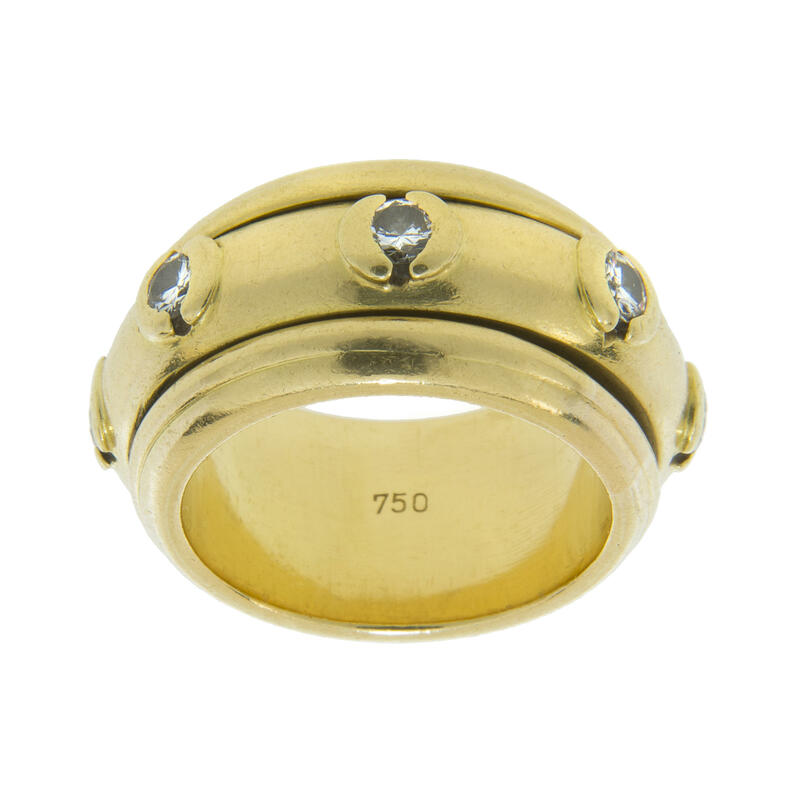 Certificate Stoess 7660,- DM, ring width 16 mm. Alloy 750 / 000. Despite the restriction a very nice ring. 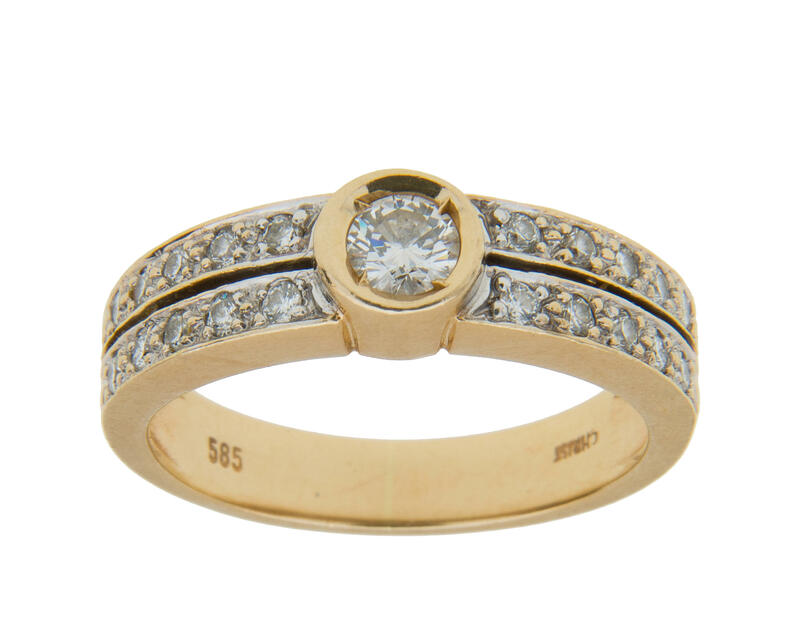 3267 Ring Diamond ring - 14 K yellow gold, set with 61 small diamonds, ring width 57. Alloy 585 / 000. A very nice ring. 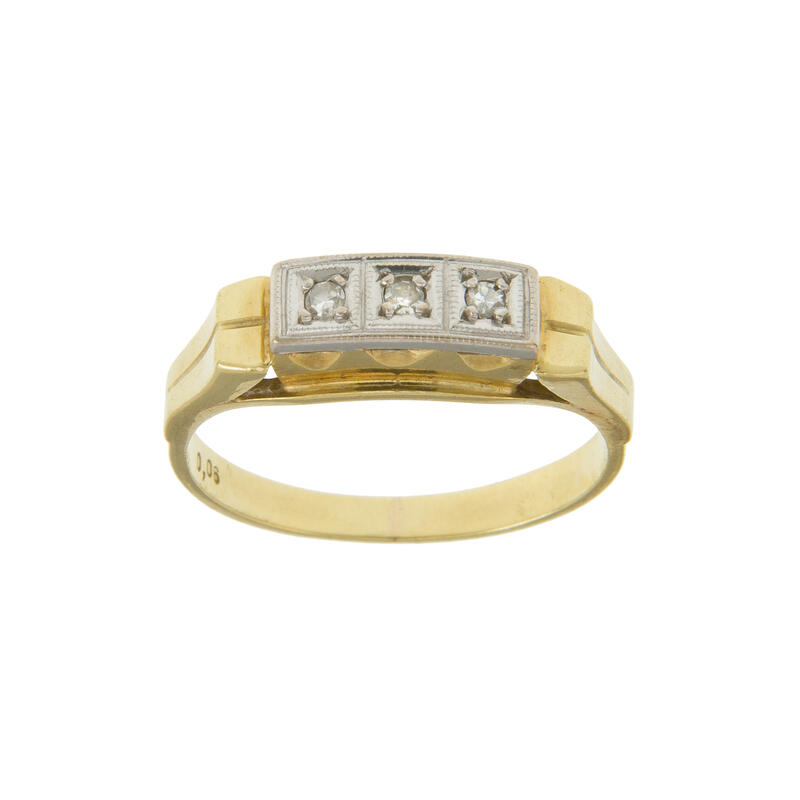 3268 Ring Brilliant ring - \"CHRIST\", 14 K yellow gold, occupies with a brilliant-cut diamond with approximate 0, 3 ct. As well 20 further brilliant-cut diamonds, ring size 56, alloy 585 / 000. A very nice ring with worn traces. 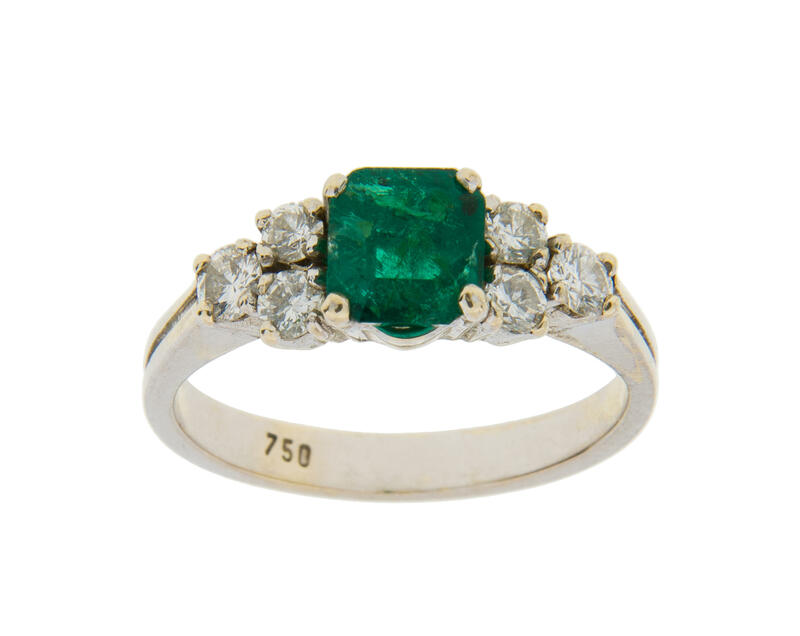 3269 Ring Emerald brilliant ring - 18 K white gold, set with an emerald (tear) approximate 0, 9 ct. As well 32 brilliant-cut diamonds SI2 / W with together approximate 0, 8 ct, ring size 52. Alloy 750 / 000. A nice ring. 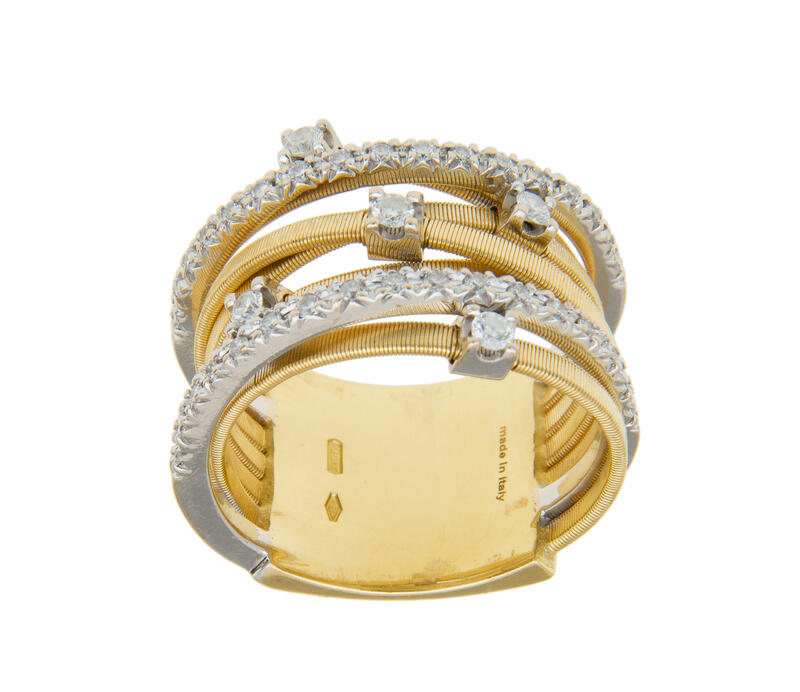 3270 Ring Brilliant ring - 18 K yellow gold, set with three brilliant-cut diamonds, ring size 55. Alloy 750 / 000. Very nice ring. 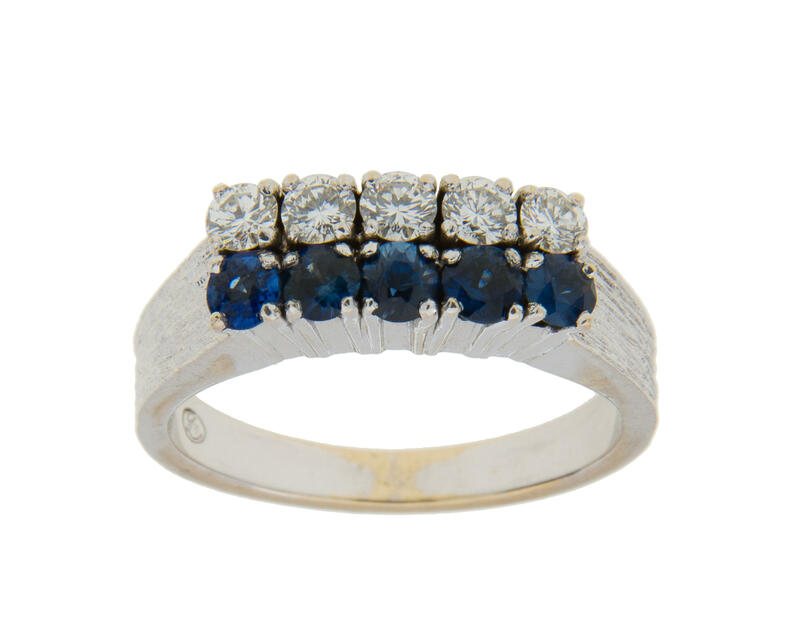 3271 Ring Sapphire brillant ring - 18 K white gold, set with in each case five sapphires and brilliant-cut diamonds TW / VSI with together approximate 0, 25 ct. Ring size 52, alloy 750 / 000. A very nice ring. 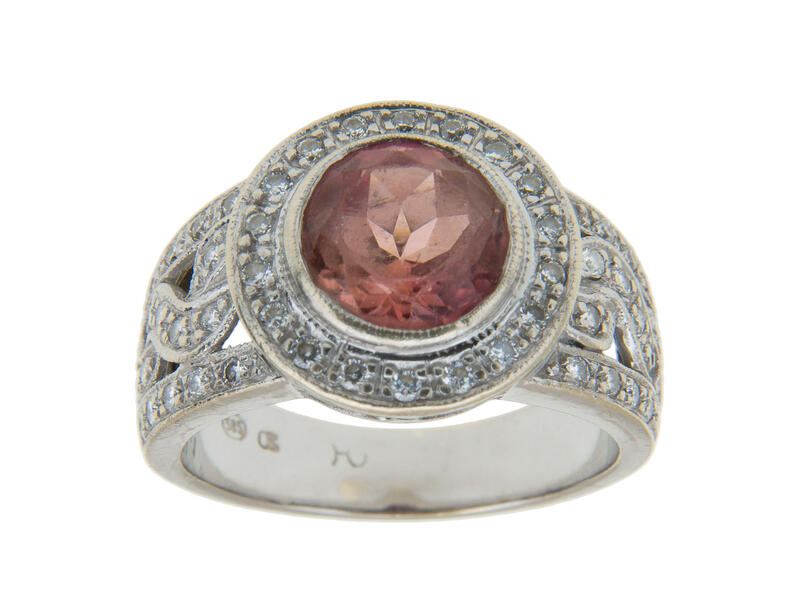 3272 Ring Tourmaline ring - 14 K white gold, set with a synthetic tourmaline with approximate 1, 5 ct. As well 52 small brilliant-cut diamonds W / VSI with together approximate 0, 26 ct, worn traces. Ring size 54. Alloy 585 / 000. 3273 Ring Brilliant ring - 18 K white gold, set with a yellowish brilliant-cut diamonds with approximate 0, 45 ct. Ring size 52, alloy 750 / 000. A nice ring. 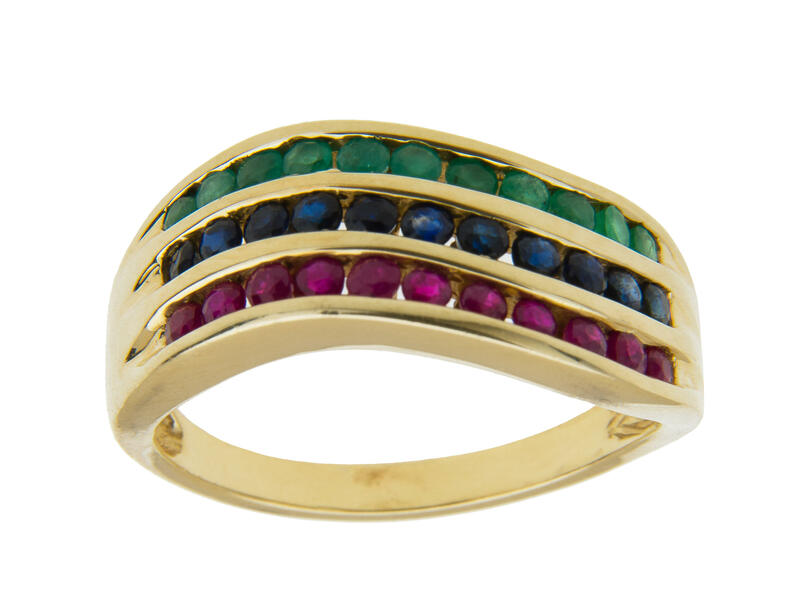 3274 Ring Tri-colour ring - 14 K yellow gold, set with always one alignment sapphires, rubie and emeralds. Ring size 62. Alloy 585 / 000. A nice ring. 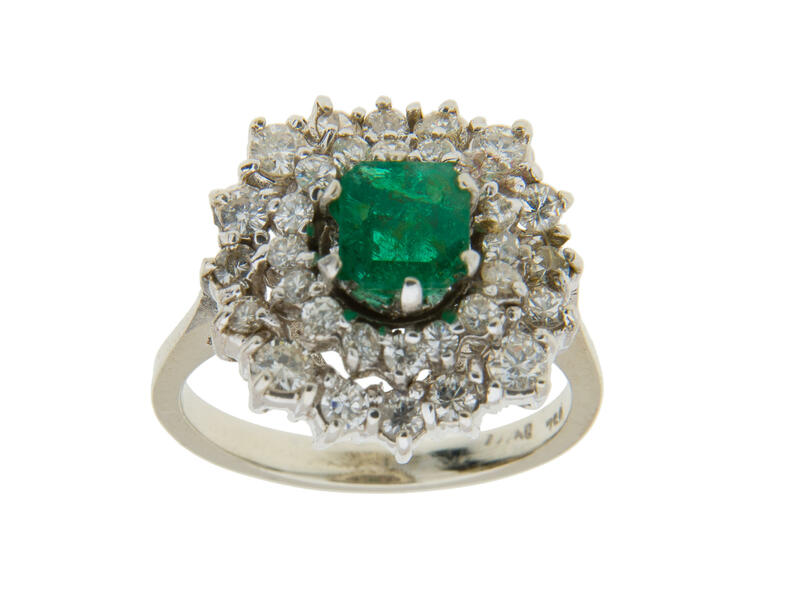 3275 Ring Emerald brillant ring - 18 K white gold, set with an emerald (tear) with 0, 7 ct. As well six brilliant-cut diamonds W / Sowed with together approximate 0, 36 ct, ring size 51, alloy 750 / 000. A nice ring. 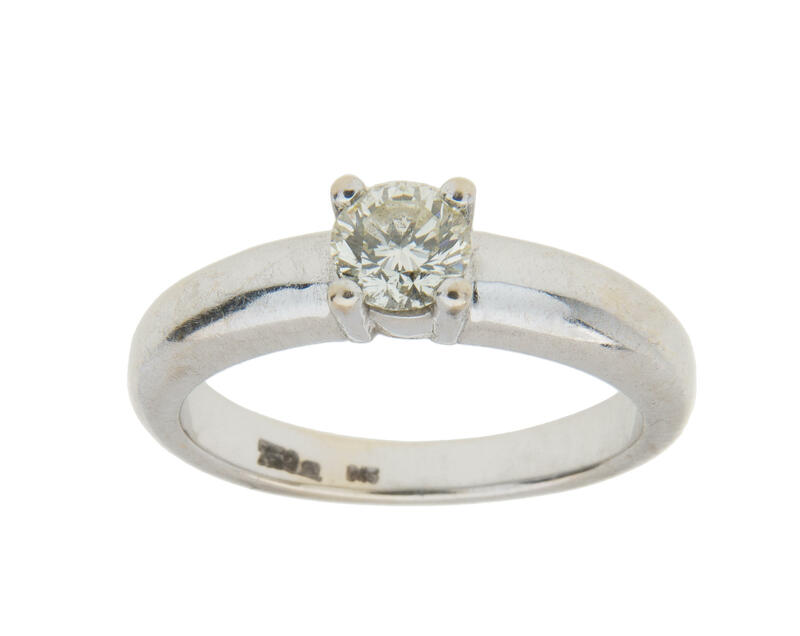 3276 Ring Brilliant ring - 18 K white gold, set with a brillant W / SI2 with approximate 0, 10 ct. Ring size 55. Alloy 750 / 000. A wonderful ring. 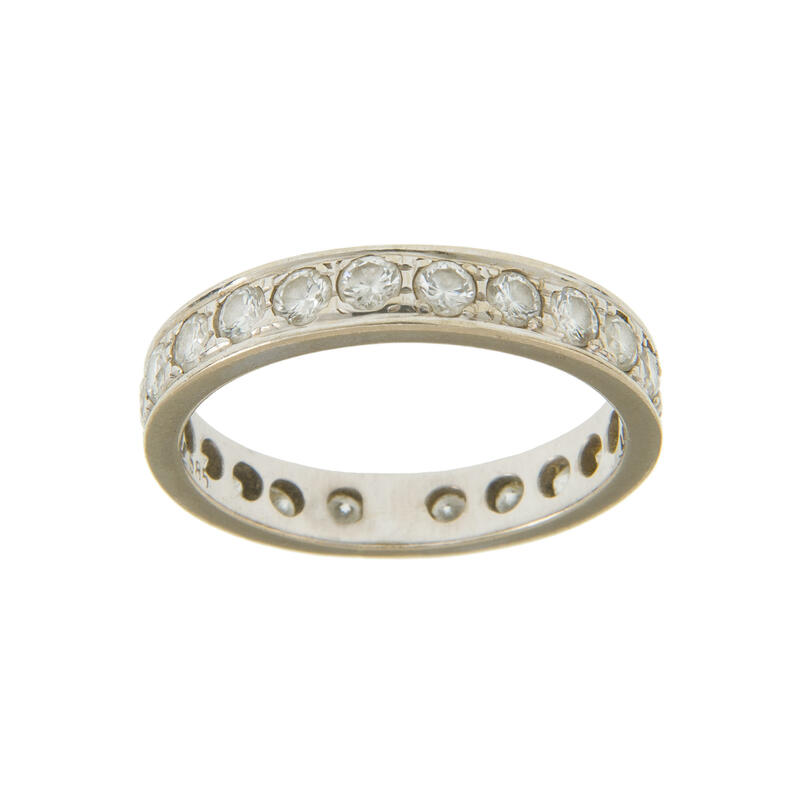 3277 Ring Brilliant ring - 14 K yellow / white gold, set with three brilliant-cut diamonds. Ring size 57. Alloy 585 / 000. 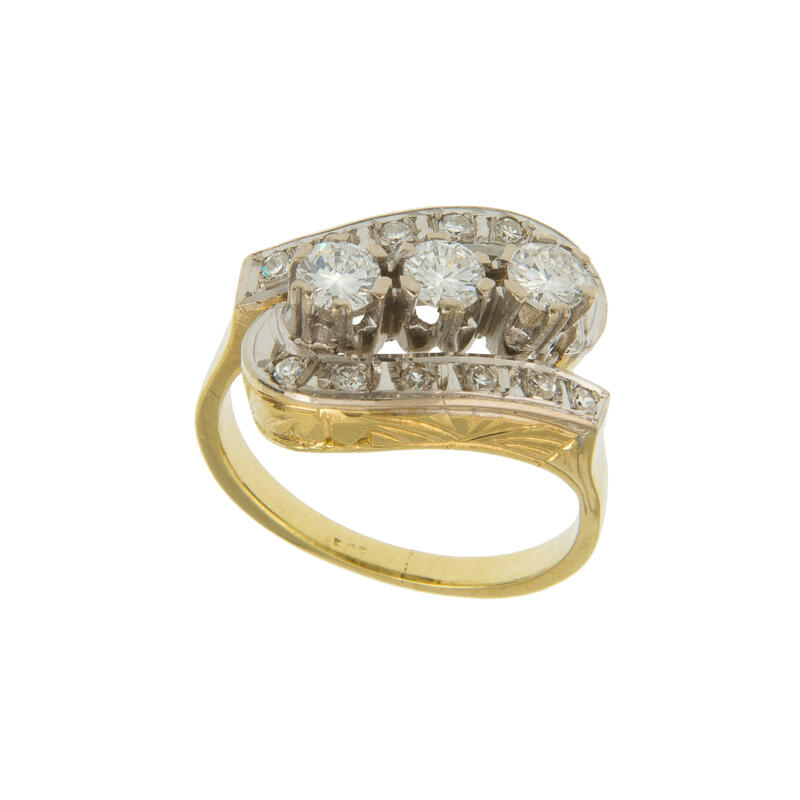 A nice ArtÂ Deco ring.